DyCom’s “Connecting People” solutions provides people with network connectivity using Wi-Fi Technology, on either 2.4GHz and/or 5GHz unlicensed frequencies spectrum. This enable mobile computing devices, tablets and smart phones to connect. These devices are revolutionising the way that we conduct our day to day business. Devices can be handheld or vehicle mounted and connected to the organisation’s voice, data or video systems. We build these networks using the Ruckus Wireless Zoneflex system. Our focus is in operational simplicity, robust coverage and high performance. In education institutions laptop devices and IPADs are being used by students and teachers to access educational content. In hospitals and health care facilities nurses and doctors are using handheld devices for patient management. In warehouses staff uses barcode scanners and RFID readers to precisely locate stock. In offices we move laptops and tablets around to facilitate cooperative workplaces. In water treatment plants engineers move among the plant changing its operational parameters and seeing the results. In ice skating rinks maintenance staff use wireless VOIP phones for access to their voice communication systems. At one of our major clients head office the Ruckus Zoneflex system connects wireless projectors, wireless printers, laptops, tablets and smartphones to securely connect to the corporate network allowing a mobile and cooperatively workplace. Users can move around between interstate offices and transparently connect to the wireless network. They use BYOD techniques to allow secure fast access to the organisation network. The Ruckus Zoneflex system provides a reliable internet connections for guests of a boutique service apartment complex in Docklands Melbourne. Guest passes are automatically generated and distributed to guests on arrival. Students and teachers use laptop devices, and tablets to access educational content and programs in schools. Content can be educational programs, applications or high definition video. Schools use BYOD techniques to reduce the management burden of the IT staff. 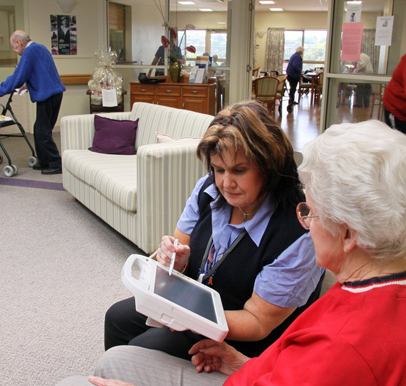 Nurses and doctors use handheld devices such as laptops and tablets for patient management at aged care facilities and hospitals. They also use specialised voice recognition devices to contact nurses in the premises. Logistics staff uses barcode scanners, voice activated terminals and RFID readers to precisely and accurately put away, locate, pick and pack stock. Water engineers use ruggedized tablets to move among the treatment plants changing its operational parameters in the SCADA systems and seeing the results first hand as the parameters are changed. On-site engineers use in their vehicle terminals to look at the their job status and update information. They connect to the Wi-Fi as soon as they drive in the depot gate. Building maintenance staff at an ice skating rink use wireless VOIP phones for access their voice communication systems. Parents waiting for their kids can access the Internet via the Public Wi-Fi facilities. In Victoria a lift operator uses tablets on the Ruckus Wi-Fi system to verify tickets and assist skiers with directions. Coaching staff of a football club use video on the field to provide immediate video feedback to players during training sessions.